A six bedroomed semi-detached Victorian property positioned in this prime Uphill location on Greetwell Road, close to the Cathedral Quarter of Lincoln. The property has spacious living accommodation across four floors and is ideally suited as a family home. The property has internal accommodation to comprise of Entrance Porch, Reception Hallway, Lounge, Dining Room, Family Room, Kitchen with Breakfast Room, Utility Room, Boot Room/WC, Pantry, Rear Entrance Hallway, a further Utility Room and steps down to two Cellars. The First Floor Landing gives access to six Bedrooms, a Box Room and Two Family Bathrooms. Outside the property has a landscaped front garden, a driveway giving access to the Double Garage and a larger than average mature plot to the rear with views over the City. Viewing of the property is highly recommended. ENTRANCE 6′ 2" x 6′ 11" (1.88m x 2.11m) , with door to the front aspect, mosaic tile flooring, windows and door to the reception hallway. 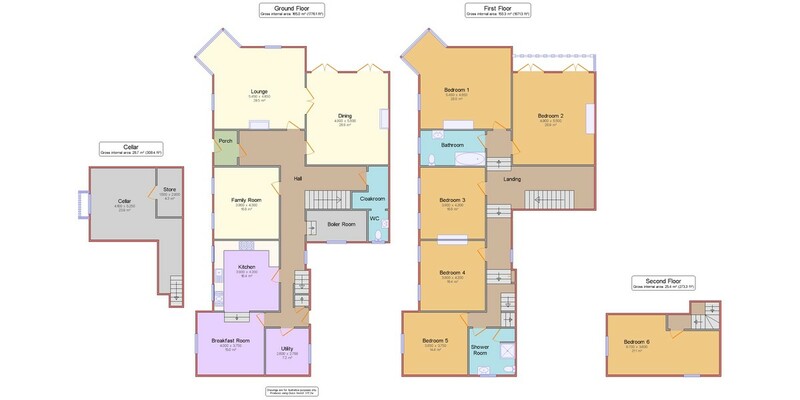 RECEPTION HALL With door and windows to the entrance, wooden flooring, doors leading to the lounge, dining room, family room, boot room/WC, pantry, kitchen, stairs to the first floor landing and steps down to the rear entrance. LOUNGE 15′ 11" x 17′ 10" (4.85m x 5.44m) , with double doors to the dining room, walk-in bay window, wooden sash windows overlooking the rear garden, windows to the side aspect, radiator, open fireplace with marble hearth and decorative surround, decorate coving and ceiling rose. DINING ROOM 16′ 0" x 18′ 6" (4.88m x 5.64m) , with two double doors to the rear garden, wooden flooring, radiator, open fireplace with decorative surround, coving and ceiling rose. FAMILY ROOM 14′ 1" x 13′ 2" (4.29m x 4.01m) , with wooden sash window to the front aspect, radiator, open fireplace with decorative surround, wooden flooring, coving and ceiling rose. BOOT ROOM / WC 15′ 4" x 3′ 11" (4.67m x 1.19m) , with wooden sash window to the front aspect, WC, wash hand basin, radiator and shelving. UTILITY ROOM 5′ 11" x 9′ 8" (1.8m x 2.95m) , with window to the rear aspect, tiled flooring, shelving and floor mounted gas central heating boiler. KITCHEN 13′ 7" x 13′ 0" (4.14m x 3.96m) , with wooden sash windows to the side aspect, wooden flooring, fitted with base units and drawers with work surfaces over, stainless steel sink unit and drainer with mixer tap above, spaces for Aga and Range Cooker, wall mounted units with complementary tiling below, space for a fridge freezer and steps down to the breakfast room. BREAKFAST ROOM 13′ 3" x 12′ 4" (4.04m x 3.76m) , with wooden sash windows, tiled flooring, decorative original iron oven, fitted storage cupboards with display cabinets, radiator and door to the rear entrance. REAR ENTRANCE With door to the side aspect, tiled flooring, under stairs storage cupboard and doors to the breakfast room, utility room and cellar. UTILITY ROOM 8′ 4" x 8′ 7" (2.54m x 2.62m) , with window to the side aspect, fitted with base units and drawers, stainless steel sink unit and drainer with mixer tap above, spaces for automatic washing machine and fridge freezer and stairs down to the cellar. CELLAR 5′ 9" x 14′ 10" (1.75m x 4.52m) , with power, lighting and doors to the WC and further cellar. CELLAR 2 14′ 0" x 13′ 1" (4.27m x 3.99m) , with walk-in storage cupboard, traditional air raid shelter, power and lighting. FIRST FLOOR LANDING With door to the box room, radiator, archway to the split level landing and doors to four bedrooms and family bathroom, steps down to bedroom 5 and another bathroom. BEDROOM 1 16′ 4" x 18′ 2" (4.98m x 5.54m) , with wooden sash window to the side aspect, feature walk-in secondary glazed bay window overlooking the rear garden, decorative coving and radiator. BEDROOM 2 18′ 2" x 16′ 0" (5.54m x 4.88m) , with double glazed double doors to the balcony with views over the garden, wooden flooring, fitted wardrobes, decorative coving to ceiling and radiator. BATHROOM 13′ 1" x 6′ 10" (3.99m x 2.08m) , with wooden sash window to the side aspect, suite to comprise of bath with shower over, WC and wash hand basin with vanity cupboard, radiator and airing cupboard housing hot water tank and shelving. BEDROOM 3 14′ 0" x 13′ 2" (4.27m x 4.01m) , with wooden sash window to the side aspect, fitted storage cupboard, wash hand basin and decorative coving. BEDROOM 4 12′ 5" x 12′ 1" (3.78m x 3.68m) , with wooden sash window to the side aspect, radiator and decorative coving. LOWER LANDING With steps down to the second bathroom and bedroom 5. BATHROOM 2 8′ 11" x 9′ 1" (2.72m x 2.77m) , with wooden sash window, suite to comprise of shower, WC and wash hand basin, wooden flooring, radiator and airing cupboard housing the hot water tank and shelving. BEDROOM 5 12′ 9" x 12′ 5" (3.89m x 3.78m) , with wooden sash window to the side aspect and radiator. SECOND FLOOR LANDING With stairs up from the lower level landing. BEDROOM 6 12′ 1" x 12′ 5" (3.68m x 3.78m) , with wooden sash window to the side aspect and radiator. OUTSIDE To the front of the property there is a landscaped knot garden with paved seating areas, decorative gravelled beds, mature shrubs and trees. There is a gated driveway providing off road parking for several vehicles and giving access to the Detached Double Garage. To the side of the property there is a covered seating area with doors to two outside brick storage areas. To the rear of the property there a well-stocked mature garden with steps up to a paved seating area, extensive lawned garden and decorative gravelled path with brick edging, mature shrubs and trees and views over the city. DETACHED DOUBLE GARAGE 17′ 4" x 17′ 0" (5.28m x 5.18m) , with up and over door to the front aspect, power and lighting.